Basil Harwood was born in Woodhouse, Gloucestershire in 1859. He was a pupil of Carl Reinecke (1824 - 1910) in Leipzig. Reinecke was a prolific composer writing operas, concertos, symphonies and some splendid chamber music. Harwood mainly wrote for the organ and the church. Some of his organ music was innovative for the day. I remember struggling with a piece which was for left hand and pedals only. To my mind, he is the British equivalent of Rheinberger (1839 - 1901) who wrote 20 organ sonatas himself. Harwood was organist at Ely (1887 - 92) and at Christ Church, Oxford (1892 - 1907) and died in London in 1949. The organ sonata used to be a popular medium but it has fallen into neglect by composers in recent times and this is partly due to some pretty inept compositions in this genre. Many organists felt that they had to compose for their instruments but often the results were poor. A brilliant organist does not guarantee a brilliant composer. 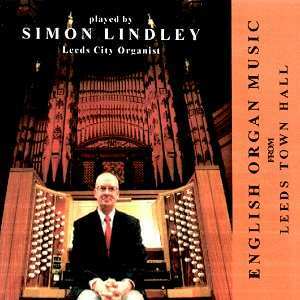 Harwood's Sonata No 1 in C sharp minor, Op 5 is a really good piece and Leeds Town Hall Organ does it proud. The opening movement allegro appassionato is very well conceived; the andante is melodious and can you work out the similarity to a hymn tune. The brief maestoso leads to the obligatory fugue which form is so predictable that it slightly spoils this otherwise excellent work. How well I remember playing the organ music of Percy Whitlock when I was a boy. I still treasure Oxford University Press's edition of the Five Short Pieces. Whitlock had a short life (1903 - 1946) but the Four Extemporisations are a good introduction to his music which has a pastoral folk-song-like idiom at times in which shimmering heat on pleasant meadows is often evoked. The Carol is very beautiful and Simon Lindley's registration is expertly judged. The Divertimento movement sounds a little confused as if brain and fingers are not quite together. Fidelis is another pastoral piece and the famous fanfare ... famous to serious organists ... but fanfare? At times I felt I was in North Africa! Peter Hurford was born in 1930 and studied at RCM and at Cambridge. In 1958 he became Master of Music at St Albans. He is a very fine organist and, like Harwood, has written for the king of instruments and for the church. His Suite: Laudate Dominium is in six movements and while it may not be strikingly original it is well-written and enjoyable. A few parts of the work are, in fact, rather ordinary and there are one or two blemishes in the performance. Hurford's music seems to be looking back and is therefore not a product of its time. The pieces by Norman Cocker (1889 - 1953) are most rewarding. I did find Lindley's staccato in the Tuba Tune a little excessive. Vaughan Williams's Three Preludes on Welsh Hymn Tunes are not striking either but the recording engineer, who is excellent throughout this CD, excels himself at the magnificently controlled crescendo at the end of Hyfrodol, a glorious tune if ever there was one.